Nice to finally meet you, Mr. Sea Trout! One of New England's most elusive game fish is the sea run brown trout ("sea trout" in Europe). You only hear rumblings about them here in Connecticut. I think it's partly due to the fact that people in the know don't want competition for a fish that's scarce to begin with. Also, they're not really a great fish to pursue for those who simply must catch something. My limited experience with these ghosts has been humbling to say the least...though not humbling enough to turn me off. In fact, chasing them is starting to become my other fishing obsession (second only to Atlantic salmon fishing). I'm not going to reveal too much in the way of specifics here. Honestly, I don't know all that much. I only began fishing for them last season. I still have everything to learn about them. I was successful in catching a few, however. All the fish I hooked seemed to follow some general trends. After catching one in the 5# class on my first trip (beginner's luck), I had a streak of about 6-8 outings in a row without so much as a pull. The next fish planted the seed of a certain trend forming and the following one drove the lesson home. All it took was about 2.5 weeks worth of outings for me to get it through my thick skull. While I was busy getting skunked day in and day out, my friends were hammering resident trout on the Farmington and Housatonic Rivers. What are these trends? I'm afraid you're going to have to figure them out on your own! It took a lot of research and dues paying to get such meager results, but it was worth the effort. I found my own little slice of angling refuge and I'd like to keep it that way. It's not like it's any secret. The information is there for those who care to do the research. I will post some thoughts though. I feel like some aspects of this local fishery go almost completely ignored. 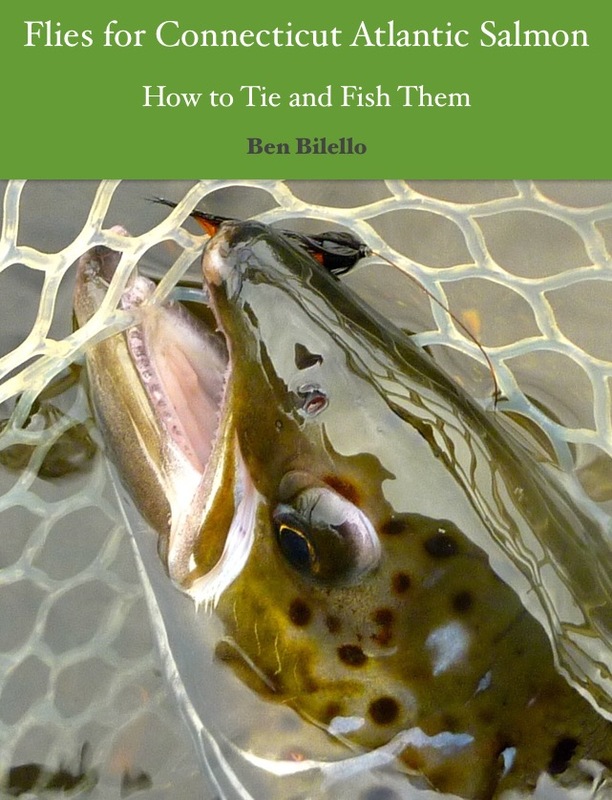 Like I tell people with regards to broodstock salmon fishing, the first thing to do is to read a book about it. I have three knowledge bases to drawn on when chasing these fish...one was from personal experience abroad, the second is from reading about how it's done "across the pond" and the other is from local sources and going out there and doing it close to home. My first run-in with sea run brown trout was in Nova Scotia. I was on a salmon fishing trip with friends and we fished a couple of sea trout runs between salmon fishing outings. I caught one puny sea run brown, but saw a couple of fish landed that were a little bigger. At times, I thought I could have been fishing for striped bass. Schools of trout slashed through schools of bait. My first source of info was from direct experience with the fish and the fishermen who chased them, albeit brief. My second source of info was voracious research on all things European sea trout-related. Books, videos, websites, internet forums, personal correspondence...even an in-depth conversation on a flight from Murmansk to Moscow. Every little bit helped, though. I noticed distinct differences between sea trout fishing in the UK and sea trout fishing in the Baltic countries (mostly Denmark). Speaking in the most general terms, UK sea trout fishing reminded me of Atlantic salmon fishing, where as Baltic sea trout fishing reminded me of what I saw in Nova Scotia, but with more saltwater. My two favorite sources for info are Hugh Falkus's "Sea Trout Fishing" and Martin Jorgensen's Global Fly Fisher website. The third piece of the puzzle was from relatively local sources. By "local," I mean from all over New England. From what I gathered through reading and from talking to people, New England sea run brown fishing sounded like a cold-weather version of Nova Scotia fishing, but with fewer trout. The synthesis of all these sources is still happening in my mind and will continue for some time. I will say this, however...without a little of that synthesis taking place last year, I never would have caught the few I did, much less a very respectably sized southern New England sea run brown trout (the second one was no slouch either and was the prettiest brown trout I've ever caught...dime bright, clean as a whistle!). Curiosity, research, perseverance and thinking a bit outside of the box paid off (and luck). This is probably an appropriate subject for my first blog post of 2013. The thought of hooking more salty browns has replaced salmon fishing, if only temporarily. Good luck with the sea run browns! It doesn't surprise me that you've taken to stalking ghosts but I'm sure you'll figure it out pretty soon! ben, interesting to hear how you get on. fished for them 2 years ago when i last went home to ireland. they followed the mackerel, we think. but it was a tide thing. 2 hours before and after high. hooked one but he jumped right off. but it was a bit like church pool in may. unless you went out after midnight, which a lot do. looking forward to hearing how you get on. looking forward to Spring!